Want to add an extra edge at training? Want to look stylish and intimidating as you perfect your technique? Well as always we have all of your needs covered at Sidekick HQ as we unleash the new Cobra series of Muay Thai style boxing gloves. These superior boxing gloves are velcro fastening and made from the highest grade of genuine leather. Boxing gloves come in the sizes 10oz, 12oz, 14oz and 16oz. Strike safely, strike like a Cobra, we are always in your corner. The official Kombat zone competition boxing gloves are a traditional lace up glove made with real cowhide leather. Kombat Zone is a prestigious kickboxing promotion Sanctioned by the I. K. F going back for many years. These boxing gloves are finished in an eye catching red and silver colour theme. These 10oz lace up boxing gloves give superior comfort with their built in hand mold and easy fit design. 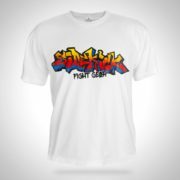 Stylish and comfortable and great support for strong pro fight gloves. These boxing gloves are hand crafted in a fantastic synthetic leather design with our symbolic logo giving maximum movement and support. 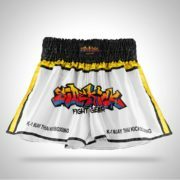 They are available in both 10oz and 16oz making them perfect for all aspects of boxing for bag work, pad drills or competitions. 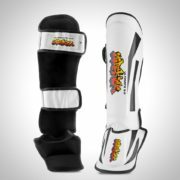 For those sparring or heavy bag work we would recommend the 16oz. The velcro wrist strap not only protects the wrist but makes them easy assessable between rounds. Bring out that inner Samurai with these Samurai series boxing gloves! The Ultimate 2.0 boxing gloves are the benchmark for the latest in boxing glove technology. These are our newest Ultimate model, proven to be even better than before! These boxing gloves are in a sleek, modern, dynamic design that contours the hands perfectly and will help improve hand speed and combinations. Made from a super durable cowhide leather and detailed stitched to ensure they will last. These boxing gloves also feature our unique air flow system to keep the hands cool and filled with a high shock reducing padding to absorb the most gruelling of punishment. An embossed label gives the ultimate branding style. Ultimate performance, ultimate protection. THE ULTIMATE! The Ultimate 3.0 boxing gloves are the pinnacle in boxing glove technology. These are our third and newest Ultimate model, proven to be even better than before! These boxing gloves are in a sleek, modern, dynamic design that contours the hands perfectly and will help improve hand speed and combinations. Made from a super durable cowhide leather in a real eye catching white, gold and black colour combination and detailed stitched to ensure they will last for years. 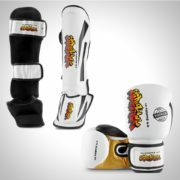 These boxing gloves are also filled with a high shock reducing padding to absorb the most grueling of punishment. Available in both 14oz and 16oz designs making them the perfect sparring glove.